The most nutrient rich food in the planet. 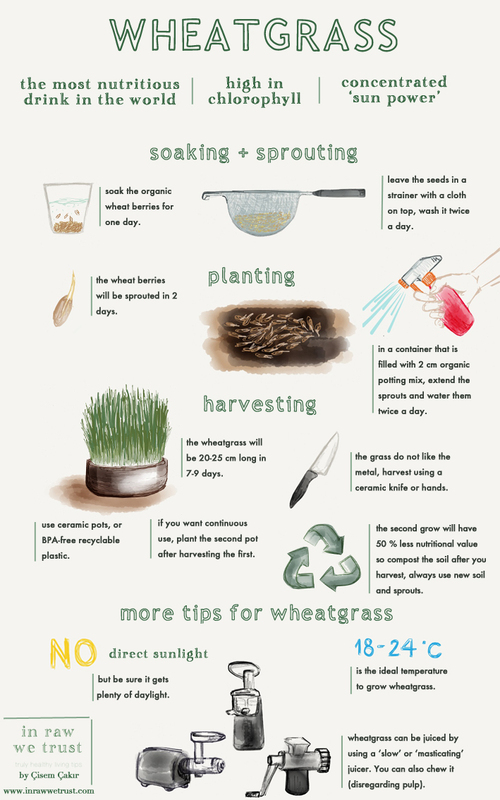 Wheatgrass is grown from the wheat seed (wheat berries) which is the whole kernel of the wheat grain. It is used for many years for its therapeutic and nutritional properties. 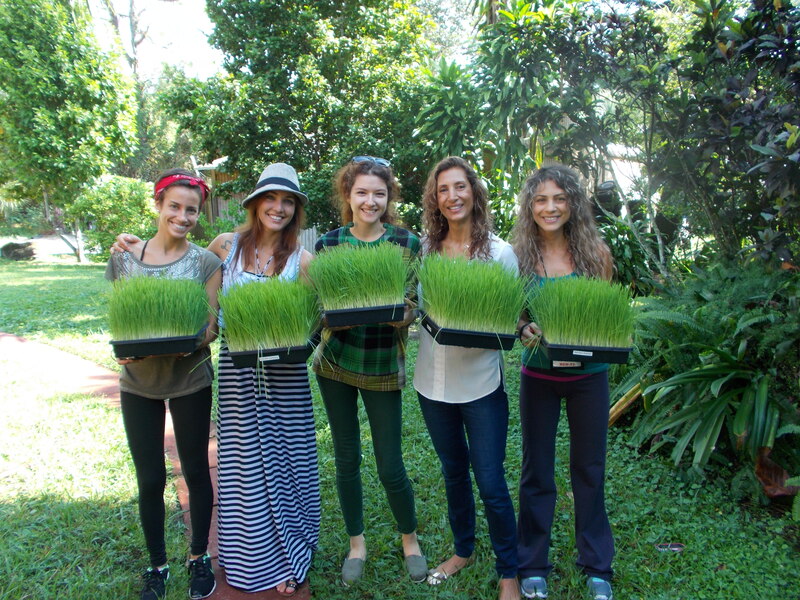 Dr. Ann Wigmore and institutes based on her teachings has been helping people get well from chronic disorders for 30 years using wheatgrass. Freshly squeezed juice is the most effective one because of the alive enzyme activity, however you can also find it in form of a dried juice concentrate, an extract, a whole leaf powder or tablets. Contains a high quality of organic calcium, phosphorus, magnesium, sodium, sulfur, zinc and potassium in a balanced ratio. one ounce (shot) contains 103 vitamins & minerals and amino acids. 2 ounces has the same nutritional value of 5 pounds of vegetables. Contains 70 % chlorophyll, which is the first product of light and therefore contains more light energy than any other element. It helps wash drug deposits from the body, purifies blood and organs and counteracts toxins. It also oxygenates the white blood cells of the body, in turn boosting the immune system. It also helps build the red blood cells, which carry oxygen to every single cell. Studies of various animals have shown chlorophyll to be free of any toxic reaction. The red cell count was returned to normal within 4 to 5 days of the administration of chlorophyll, even in those animals which were known to be extremely anemic or low in red cell count. 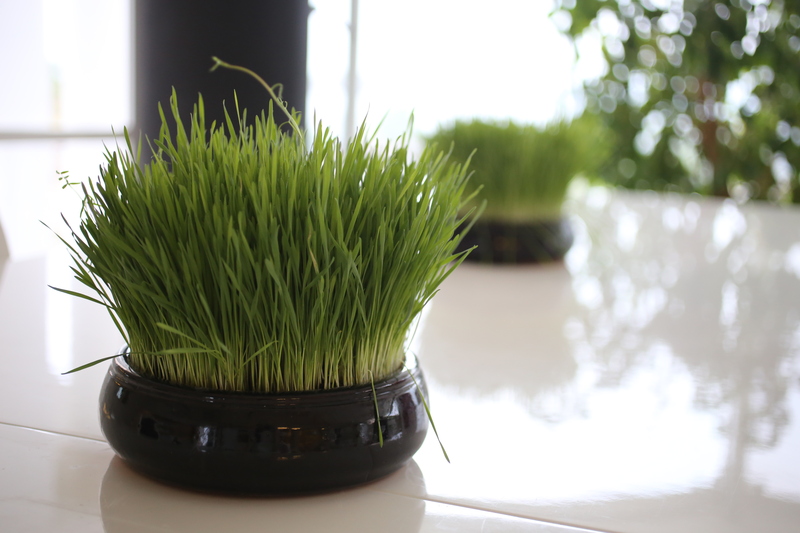 Chlorophyll can be extracted from many plants, but wheatgrass is superior because it has been found to have over 100 elements needed by man. If grown organic soil, it absorbs 92 of the known minerals from the soil. Helps remove toxic heavy metals stored in the tissues. You need to take minimum 2 ounces (1 shot), or 6 to 10 ounces for therapeutic uses. It can be taken also as a colon implant, or be used topically. Always drink it on a empty stomach, allowing 15-20 minutes to digest. The optimum way to drink it is to ‘swish’ it around your mouth to mix it with your digestive enzymes before swallowing. If you are new, start with 2 ounces and increase the amount if you like. 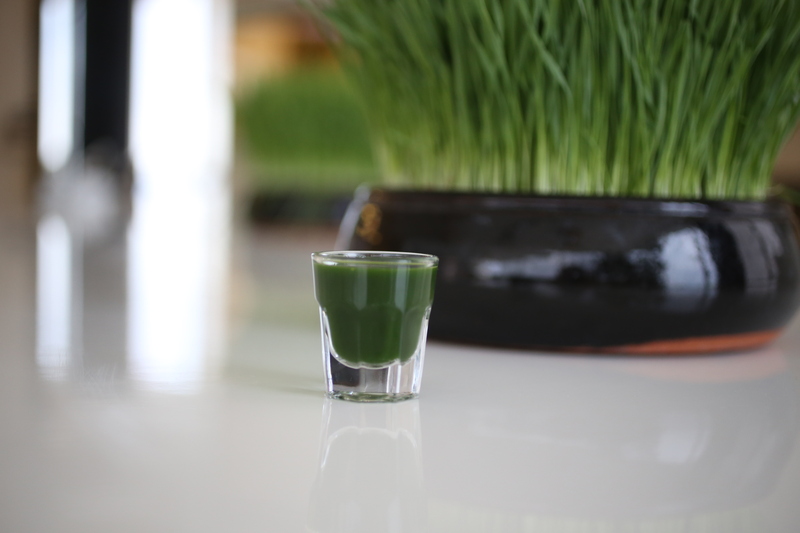 Do not drink more than 5 ounces at a time, as it is very powerful and concentrated, it may cause nausea or vomitting, which is a brief manifestation of initial impact of the wheatgrass juice upon bodily toxins. soaking, sprouting, planting, harvesting and storing.